VIDEO: UC Berkeley civil engineering assistant professor Khalid Mosalam describes the rationale for the test. A new steel frame, designed to resist seismic forces, was installed to simulate the typical way buildings like this have been retrofitted. Such retrofits often include steel beam supports. BERKELEY  In a testament to the value of high-quality construction, a full-scale three-story woodframe apartment building sustained only minor to moderate damage after University of California, Berkeley, engineers put it through a series of powerful shake tests. In the earthquake simulation conducted Dec. 21 at UC Berkeley's Richmond Field Station, the full-scale building with tuck-under parking experienced the same ground motions recorded during the 1994 Northridge earthquake. One of the more powerful of the four tests performed generated forces 20 percent greater than those at Canoga Park, a city in the San Fernando Valley located less than 10 miles south of the quake's epicenter. A similar experiment was conducted more than a week ago when steel frame retrofits had been installed in the building. In that earlier experiment, "the structural performance of the building was excellent," said Khalid Mosalam, assistant professor of civil engineering at UC Berkeley and lead investigator of the experiment. 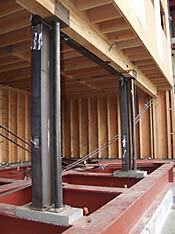 "Current seismic building codes call for these woodframe structures with tuck-under parking to be built with steel frames, but as a retrofit, that had never been put to the test until last week." Mosalam attributed the building's performance on Dec. 12 to the retrofitting and, in large part, to the finish materials that stiffened the structure's walls and joints. He explained that the steel frame used to retrofit the building helped minimize twisting motions, while finish materials  including the stucco exterior and gypsum board  helped minimize the building's lateral movements during the quake. When tested without the retrofit, the finishing materials of the structure began to show noticeable cracks, nail pullouts and sliding and separation at the building base. While the December test results were encouraging overall, Mosalam did note that they could not simulate the effects of age or neglect on a building. "We didn't have termites, mold or moisture weakening the building," he said. "If a building is not maintained properly, or if the stucco is applied improperly, the risk for damage will likely be much greater." The shake test is part of a larger $6.9 million woodframe project funded by the Federal Emergency Management Agency through the California Office of Emergency Services after the magnitude 6.7 Northridge earthquake. The Consortium of Universities for Research in Earthquake Engineering (CUREE) manages the project under subcontract to the California Institute of Technology. In the Northridge quake, 24 people died as a result of damage to woodframe buildings, including 16 people in one building with tuck-under parking in the Northridge Meadows apartment complex. In addition, damage to woodframe structures caused more than $20 billion in property loss, exceeding the financial loss from any other single type of building construction from the quake. "We're trying to find ways of preventing such destruction from occurring again in the next earthquake," said Bob Reitherman, executive director of CUREE. "We'll be using results from these tests to evaluate existing retrofit ordinances and to develop improved building codes and standards." During the 1960s and early 1970s, tens of thousands of woodframe, multi-unit residential buildings were constructed with tuck-under parking in California as a way to use space more efficiently. The tuck-under parking design dominates multi-unit residential buildings in the East Bay, particularly in Berkeley and Oakland, said Richard Eisner, regional administrator of the California Office of Emergency Services. However, such a design creates a large open area on the ground level that provides less support for the building, possibly leading to severe damage and collapse during a strong earthquake. "Ultimately, how we construct our buildings determines whether people are killed in earthquakes," said Eisner. The experiments were conducted on the nation's largest earthquake simulator, capable of moving in three dimensions simultaneously. The three-story building was also the largest structure ever tested on a shake table in the country. "This latest test shows the importance of quality control during a building's construction," said John Hall, professor of civil engineering at the California Institute of Technology and manager of the CUREE-Caltech Woodframe Project. "When constructed well, many buildings can survive significant ground forces." In practice, however, shortcuts are sometimes taken during construction that compromise the stabilizing effects of finish materials, said Hall. "When you install the stucco exterior, everything from the amount of plywood used to the number and size of nails makes a difference in the strength of the building," he said. The structure tested by UC Berkeley engineers was constructed in accordance with the uniform building code from 1964, but the installation of steel frame retrofits for such buildings are not currently required by law. "What we'd like to see is how the building would perform with other types of ground motions, particularly those of longer duration," said Mosalam. More tests are planned for the first week of January. "We expect that results from these tests will eventually be used to design safer buildings, and, in the end, to help save lives," said Mosalam. The UC Berkeley shake test was also an early demonstration of how inexpensive, wireless remote sensors can provide valuable feedback on the structural integrity of a building after an earthquake.